Next fall the chemical engineering major will take up residence on yet another continent as he pursues master’s degrees at the University of Cambridge and Imperial College London as a 2018 Marshall Scholar. Felton is just the third NC State student to receive the prestigious scholarship, established by the British parliament in 1953 to give top American students the opportunity to earn graduate degrees in the United Kingdom. The scholarship is named for American soldier and statesman George C. Marshall, who designed the European Recovery Program that helped rebuild Europe after World War II. Felton plans to make the most of the two-year scholarship by attending the University of Cambridge the first year to earn a master’s degree in chemical engineering and biotechnology, then moving to Imperial College London the second year for a master’s in nanomaterials. “I came to NC State with the idea that I wanted to combine science, math and economics — all these different fields — but how to do that, I didn’t know,” he says. When Felton toured campus before the start of his freshman year, he learned that NC State was a welcoming place that offered students lots of resources to help them succeed. “Everyone just made me feel like this was the place I was meant to be,” he says. The offer of a Park Scholarship sealed the deal. The highly competitive four-year merit scholarship not only covered his educational expenses, it also gave him access to faculty mentors, seminars, retreats and service activities. He took advantage of every opportunity that came his way, giving him a chance to build his skills as a scholar, researcher and leader. 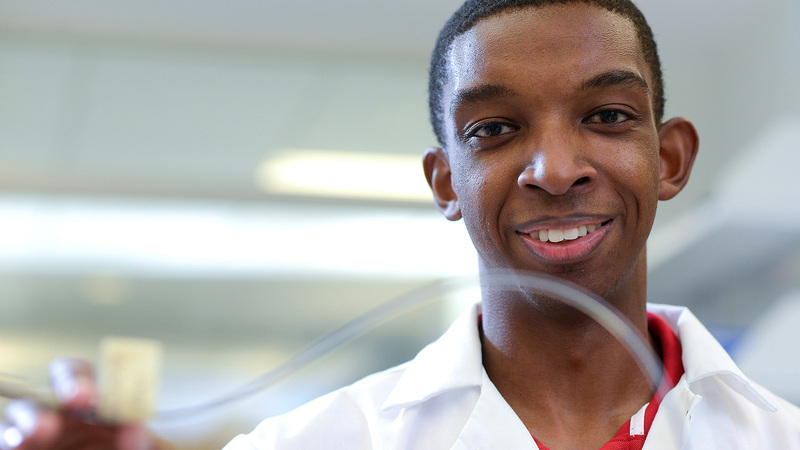 Kobi Felton conducts research into quantum dots on Centennial Campus. Photos by Marc Hall. Felton joined the campus chapter of the National Society of Black Engineers, serving as academic excellence chair in 2015 and president in 2016. Under his leadership, the chapter created 20 new programs and won a national award for member retention. “My goal there was trying to help other people learn the key skills for succeeding at a high-level university like NC State,” he says. In 2015 he traveled to the South Dakota School of Mines and Technology to participate in the Research Experience for Undergraduates sponsored by the National Science Foundation. There, he developed an algorithm in Fortran for simulating crosslinking within epoxy polymers, and he presented his findings at a research conference. As an intern at Eastman Chemical Company in Tennessee in the summer of 2016, Felton executed and analyzed simulations of more than 30 molecules and developed at a ranking formula to prioritize molecules for further simulation and experimental work. During his internship at ExxonMobil in Texas this past summer, he joined in efforts to reduce costs and improve safety at a chemical plant. Felton, who is minoring in Spanish, translated documents and served as an interpreter for Spanish-speaking clients at Durham nonprofit Kidznotes in 2015-16. He also serves as a Chancellor’s Aide and an Engineering Ambassador and is a member of the Tau Beta Pi Engineering Honor Society, Omega Chi Epsilon Chemical Engineering Honor Society, American Institute of Chemical Engineers, University Scholars and W.E.B. Du Bois Honor Society. 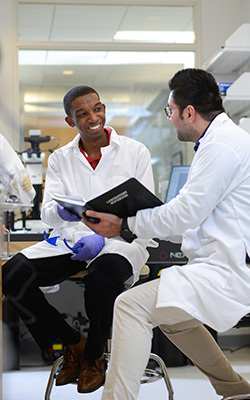 Through the Park Scholars program, Felton worked with faculty mentor Ruben Carbonell, a chemical engineering professor who directs the Golden LEAF Biomanufacturing Training and Education Center on Centennial Campus. Carbonell’s son, Tomás, was NC State’s first Marshall Scholar in 2003. “He has given me very salient advice throughout my college career that has helped me make some very important decisions,” Felton says. Felton consults with professor Milad Abolhasani in chemical and biomolecular engineering. One of his most important decisions was to join Milad Abolhasani’s lab as an undergraduate researcher. Abolhasani, an assistant professor of chemical and biomolecular engineering, specializes in microscale technologies that address the world’s energy challenges. Ultimately, the technology could lead to improvements in the color performance of television monitors while using less energy. The Marshall Scholarship is one of the most selective and academically demanding postgraduate scholarships in the country. 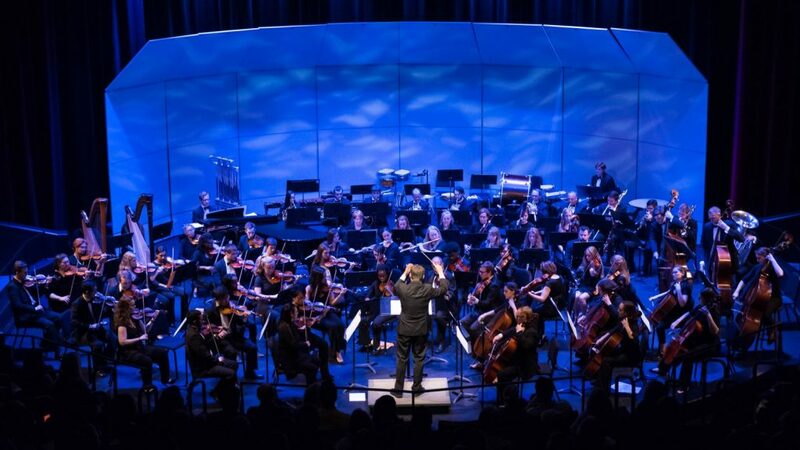 Potential applicants must first go through a rigorous screening process at their own college or university before their application is forwarded to one of the Marshall program’s eight regional selection centers. Judges review applications submitted by hundreds of universities, narrowing down the field to a short list of finalists who are then interviewed in person. Felton acknowledges that he’s a complex character, a self-described “nerd” who spends hours in the lab working with light-absorbing nanomaterials but who also has a passion for playing jazz trombone, honing his skills as an amateur photographer and immersing himself in Spanish language and literature. Packaging his diverse skills and contradictory interests for the Marshall panel involved drafting an essay and practicing his interview skills. 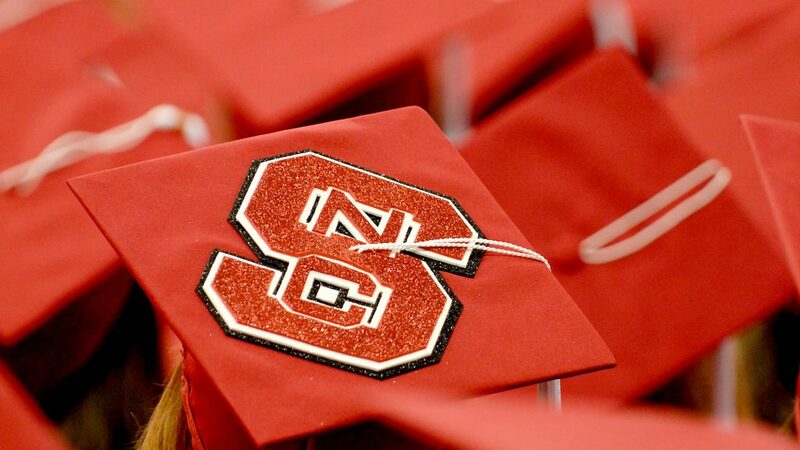 Thanks to NC State’s Fellowship Advising Office (FAO), he had plenty of support. FAO staff began working with Felton months ago after they identified him as a promising candidate for a prestigious scholarship. They set up the campus selection committee that ultimately endorsed Felton’s application. And they spent hours helping him with his written content, which is a key element in grabbing reviewers’ interest. They even arranged for a practice interviewer to help Felton prepare for the Marshall interview and provided logistical advice for his travel to and from Atlanta. The intense effort was tough, but it paid off. 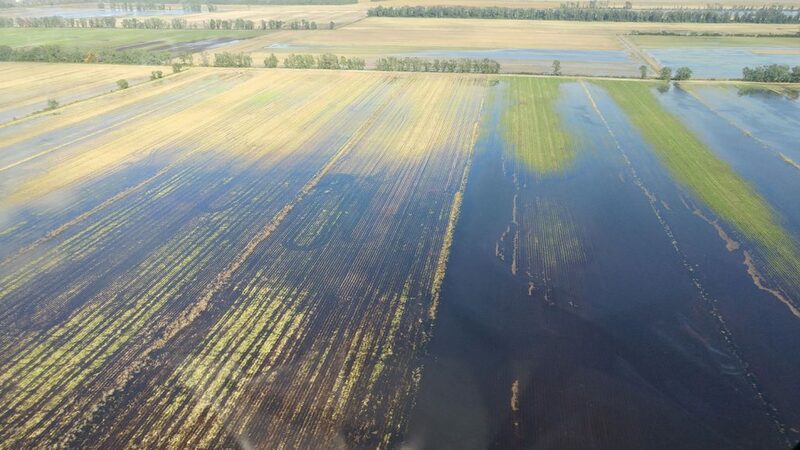 FAO Advisor and Recruiter Alsace Gallop says the office serves as an “award matchmaker,” helping students and alumni connect with fellowship and scholarship opportunities. She and FAO Director Tiffany Kershner work hard to identify promising candidates and establish a relationship with them. Kershner, an adjunct teaching assistant professor of anthropology, is thrilled Felton received the Marshall Scholarship. “His love of reading varying perspectives and works, his passion for science and his stellar communication skills will be great assets to him as a scientist and CEO of a company,” she says. As he prepares to complete his studies at NC State before heading off to the U.K. next summer, Felton enjoys looking back on an undergraduate career crowded with activities and opportunities. 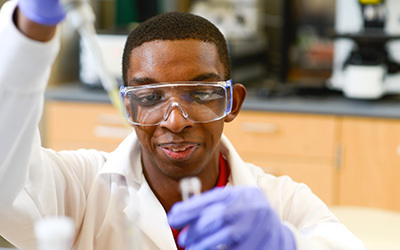 After he completes his graduate degrees through the Marshall Scholarship, Felton plans to pursue a Ph.D. in chemical engineering with a specialization in computer modeling and flow chemistry. He also hopes to commercialize a cloud-based chemistry laboratory to facilitate scientific innovation. This a wonderful article about a truly remarkable young man. Kobie, I have always been in awe of your tremendous talents, intellect, and empathy towards others. I wish you the best in all of your future pursuits. We love you Kobie, you are making our dreams come true! Can’t find adequate words to express how we feel. That’s great news Kobi. You are an impressive young man. Good luck in the UK and your dreams for a full and complete life. Ron Hall family friend. Congratulations Kobi. It was a pleasure to be your instructor for PY 205. No one has ever asked me as many questions as you did that semester.